Karina Moore wears many hats in the Teacher Education department. She is the Online Coordinator and the Director of Clinical Practice. She coordinates many online classes and their corresponding campus visits. She secures student teaching placements for each teacher candidate and tracks their data and paperwork. She does all this with an upbeat outlook. For these reasons, Karina has been selected as University of Illinois Springfield February Employee of the Month. Karina's nominator calls her a master of positive communication. "The relationship building she has done with school districts has done much to shine a positive light on the Department of Teacher Education and the University of Illinois Springfield," the nominator writes. Her supervisor says that her position in the department has no down time during the academic year. "Prioritizing allows her to produce quality work as quickly as possible," he writes, also noting her excellent communication skills that help her to excel in her job. 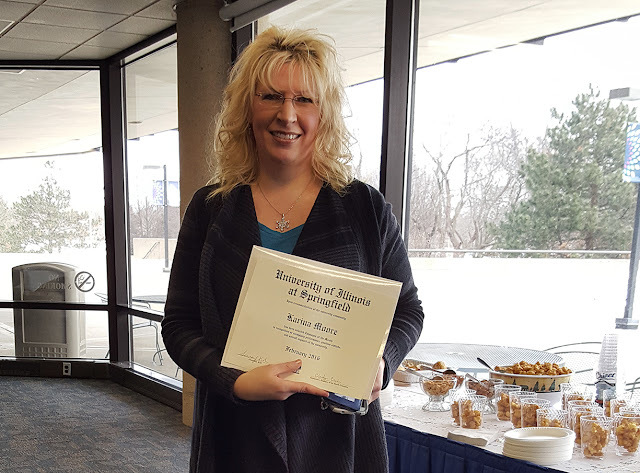 "The Department [of Teacher Education] always appreciates Karina's positive and constructive outlook and the work she does with building our partnerships," her nominator writes, "but we want the rest of the UIS community to know just how special she is and how important her work is to the rest of us." Mailing Equipment Operator Eric Needham has been named the 2015 Employee of the Year at the University of Illinois Springfield. He was honored during an annual reception on February 3, 2016 in the Sangamon Auditorium Lobby. Needham is known for a tremendous work ethic, reliability, and a friendly, engaging demeanor. 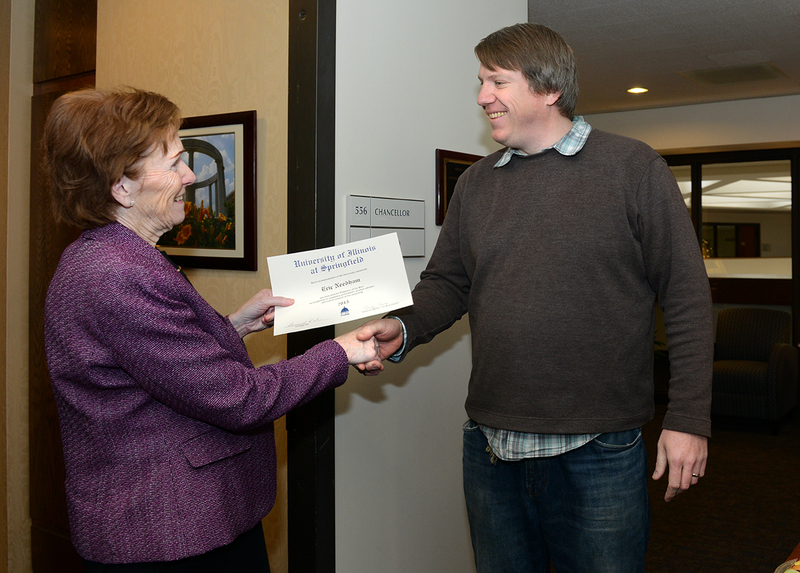 One nominator describes him as "one of the nicest employees on campus." One of the qualities most acknowledged by his colleagues is that he does what he can to make their jobs easier. His supervisor writes, "If there is something that needs to be done, Eric will do it, or volunteer to do it, even though it may be outside the scope of his duties. He wants to make sure I'm taking my days off before he takes any vacation." Needham demonstrates the qualities UIS encourages of its employees. During the awards presentation, UIS Chancellor Susan J. Koch praised the employees for their dedication and work. "To those award winners this year, thanks for all you do, and thanks for setting an example for all of us," she said.